With the "Security Setting" function of PDFCool Studio, you can control who can access to your documents and what actions they can perform once they have the password. Depending on your needs and the intended audience, you can choose between 128-bit RC4, and 128-bit AES encryption. 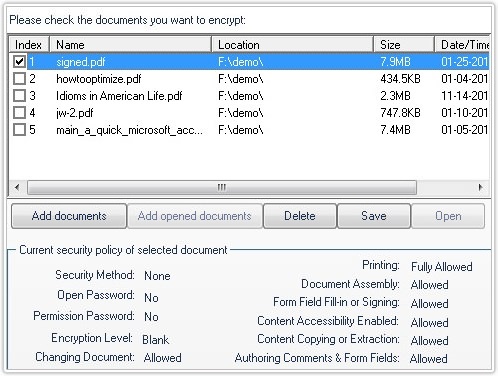 Note: The "Current security policy" show the detail security policies of a selected document. 6. Click on the Encrypt button, and finish the security setting process.